For almost 30 years Rick Wright has used light as a definer of space and accentuator of form. What started as a calculated study in solar geometry evolved into a fascination with the movement of the sun, and the shadows cast by a variety of forms and surfaces. 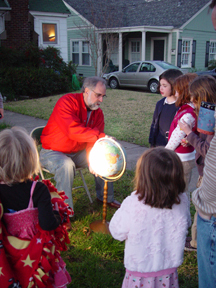 Rick demonstrates the earth-sun relationship to his family and neighbors at sunrise on this chilly Equinox morning. 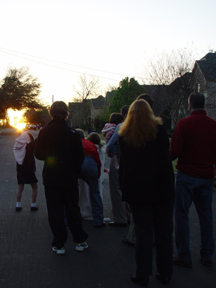 Rick’s understanding of the sun’s movement through the sky has resulted in projects which are enhanced by the admission of natural light and the careful control of unwanted solar heat. Illustrated below are several buildings and architectural elements designed by Richard Wright Architects which celebrate form, shadow patterns, and textures given life in sunlight. Given life in sunlight. Huh.